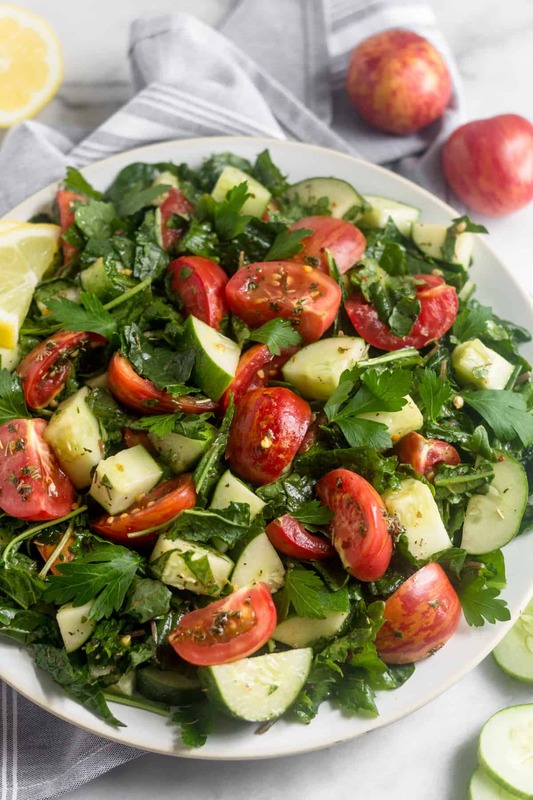 This Chopped Tomato Cucumber Kale Salad is an easy, delicious, and flavor packed summer salad! 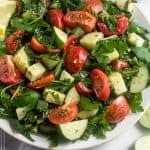 Loaded with fresh tomatoes, cucumbers, and baby kale and topped with a quick Italian dressing, it’s perfect for an easy weeknight side, BBQ side dish, or meal prep dish. 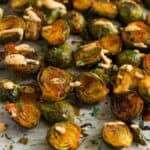 Gluten free, dairy free, vegan, paleo, and Whole30 approved! What’s your favorite summer produce pick? For me this is a really tough question. I mean I love all veggies and fruit. We have berries, cherries, tomatoes, cucumbers, watermelon, and so much more during the summer. But I think the winner is tomatoes. Summertime tomatoes are literally insane compared to ones you get in the winter. Especially if you are snagging some local ones. I pop the cherry tomatoes like candy and can eat the larger ones like apples. So so good. 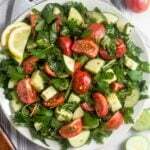 Growing up we would eat tomatoes and cucumbers all throughout summer. My parents grew tomatoes and we would always have them on hand. My dad is a huge fans of cucumbers and he would snack on them after work when we were prepping dinner. If we were eating dinner at home, we usually always had some kind of salad. 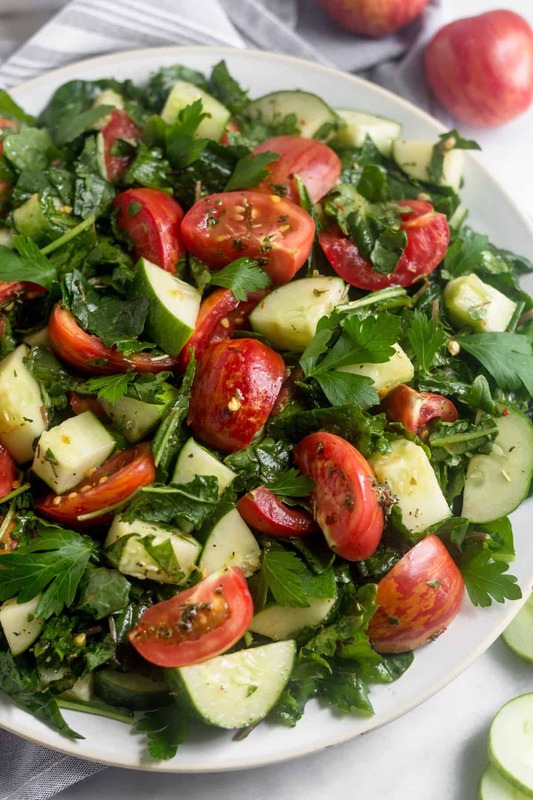 If we were in a time crunch or low on veggies, a quick tomato cucumber salad was the go-to. To assemble, first you roughly chop all the veggies. 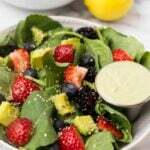 Make the dressing and then mix with the chopped cucumber and kale. Then add the tomatoes and gently toss. That’s it! I topped mine with some fresh parsley from some earthiness, but it’s totally optional. 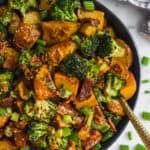 This salad works great for an easy weeknight dinner, a side dish for a summer BBQ or picnic, or even for meal prep throughout the week. To make it a full meal add some grilled chicken or salmon or even chickpeas would be good if you don’t eat meat. I made it for some meal prep clients and they loved it. I also shared it on my stories on Instagram when I was making it and had a lot of questions about it so I figured I had to share! 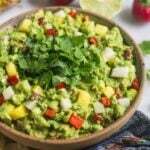 Gotta love the easy and simple summer recipes! 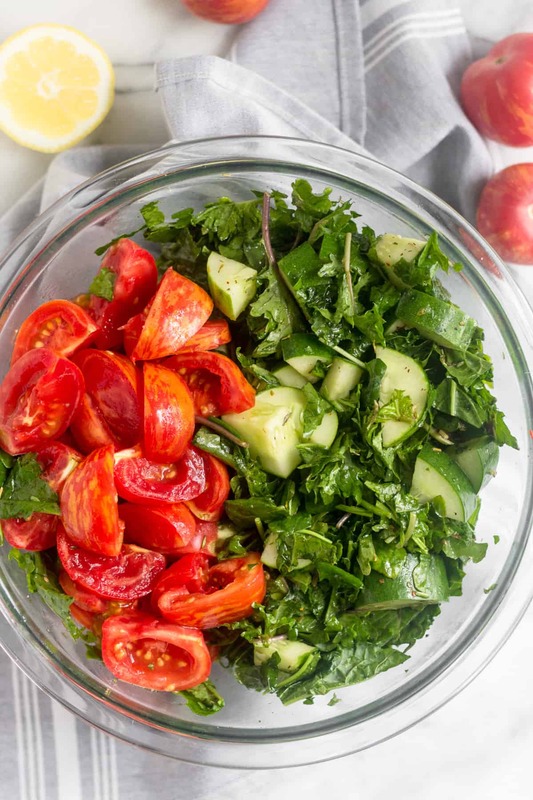 This Chopped Tomato Cucumber Kale Salad is an easy, delicious, and flavor packed summer salad! 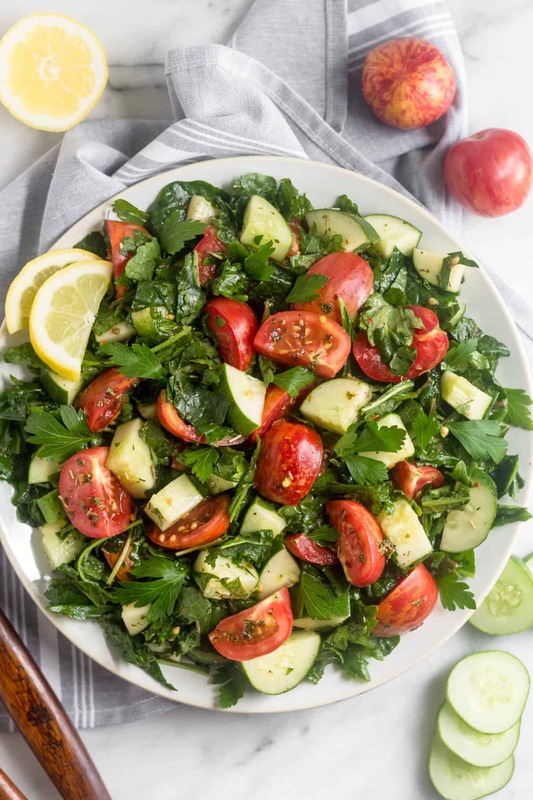 Loaded with fresh tomatoes, cucumbers, and baby kale and topped with a quick Italian dressing, it's perfect for an easy weeknight side, BBQ side dish, or meal prep dish. 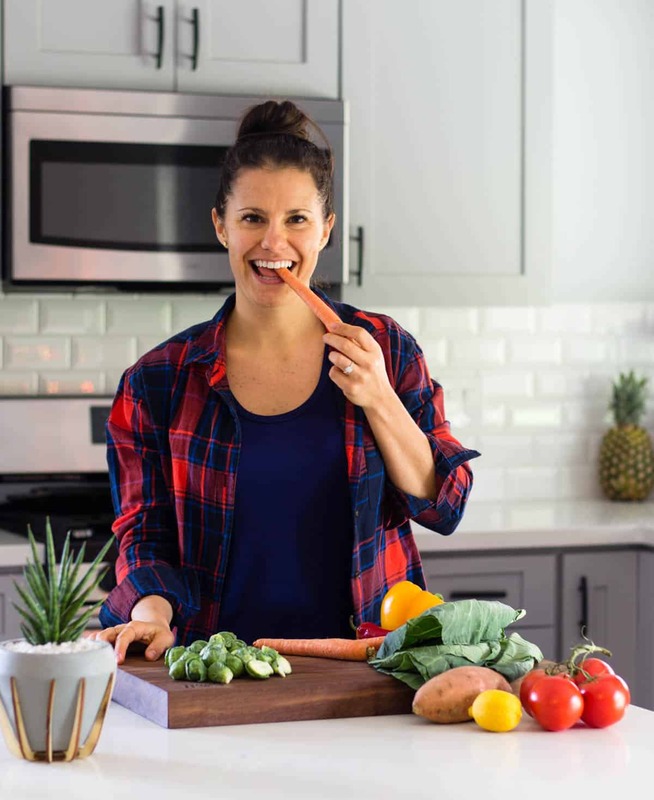 Gluten free, dairy free, vegan, paleo, and Whole30 approved! 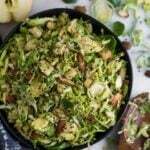 Make the dressing by putting all the ingredients into a small jar and mix well. Set aside. Roughly chop the kale and add to a large mixing bowl. 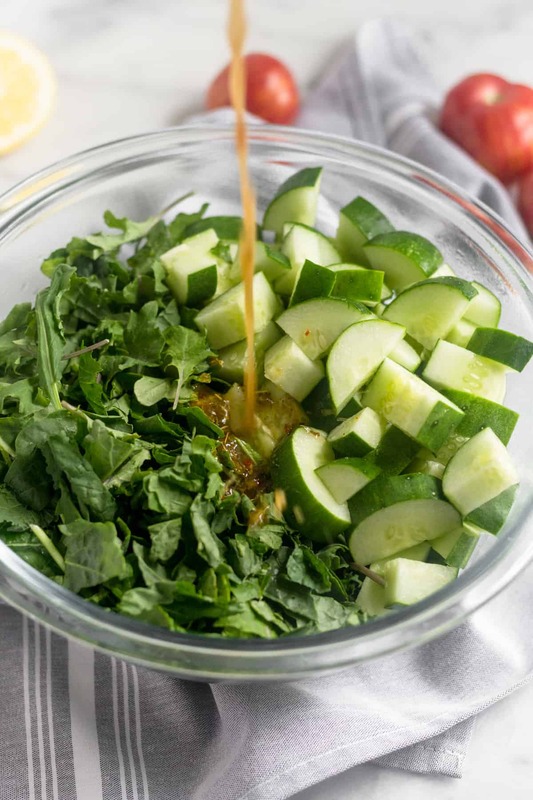 Add cucumber and dressing and mix well. Add diced tomatoes and gently toss to cover with dress. Top with fresh parsley if using.